Girl Scouts of Nassau County's Blog offers the latest news, trends and fun happening within Girl Scouts! Girl Scouting Builds Girls of Courage, Confidence and Character Who Make the World a Better Place. Happy Birthday Juliette Gordon Low! "I've got something for the girls of Savannah, and all of America, and all the world, and we're going to start it tonight!" Girl Scouts across the USA and around the world will celebrate Juliette Gordon Low's birthday on October 31...the 152nd anniversary of her birth. And as Girl Scouts of the USA celebrates our 100th Anniversary as an organization, it is easy math to see that Juliette Gordon Low started this organization when some other women in her era and her social status might have been looking forward to slowing down a bit...rather than becoming the founder of a national organization whose impact for girls and women would be felt around the world! 1. Where was Mrs. Low when she decided to start the Girl Scouts? How many girls were in that first Troop? 2. How old was Mrs. Low when she began the Girl Scouts? 3. How and where did Mrs. Low first become interested in Girl Scouting? 4. What was Mrs. Low's nickname and how do we use her nickname in Girl Scouting today? 5. Although far from behaving in any way as a disabled person, Mrs. Low did suffer a physical disability. What was it and what are some of the stories about her problem? 6. In what year did Juliette Gordon Low receive the Presidential Medal of Freedom? 7. In 2012 the first park in New York was named for Juliette Gordon Low. Where is it? 8. Mrs. Low served as the President of the Girl Scouts of the USA until 1920. What was the title that the Girl Scouts bestowed on her to use after that time? 10. When Mrs. Low began what we now know as the Girl Scouts it had a different name. What was the organization first called, and why, and when did the name become Girl Scouts? 11. Who did Girl Scout executives call "the best scout of them all?" EXTRA CREDIT: Do you think Juliette Gordon Low would be surprised or not to learn about what Girl Scouts are doing today? -- Write a birthday card to Juliette Gordon Low and tell her what you think is the best thing about Girl Scouting in 2012...Post your card on Girl Scouts of Nassau County's Facebook page. 1. 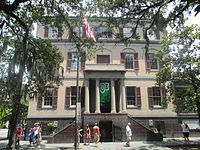 The first Girl Scout Troop began in Savannah, Georgia in 1912 and enrolled 18 girls. 2. Mrs. Low was 52 years old when she began Girl Scouting in the United States. 3. Mrs. Low became interested in Girl Scouting while living in England and meeting Lord Robert Baden-Powell, founder of the Boy Scout movement in Great Britain, and his sister, Agnes Baden-Powell, who had established the Girl Guides there. 4. Born Juliette Magill Kinzie Gordon, Juliette was known as "Daisy" to her family and friends. Today the youngest level of Girl Scouts is known as the Daisy level. 5. Mrs. Low suffered from a severe hearing loss. While having lost some of her hearing as a child, legend has it that rice thrown at her wedding lodged in her ear, and in the process of later removing the rice, her ear drum was irreparably injured. Stories abound that Mrs. Low used her hearing loss as a tactic for never hearing "no," and always getting people to do things her way! -- Mrs. Low was also know to have had back problems during her lifetime and it is reported that she died from breast cancer (in 1927). 6. 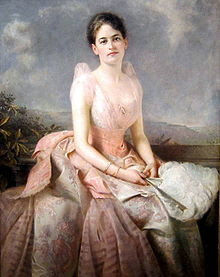 The Presidential Medal of Freedom was awarded to Juliette Gordon Low, posthumously, in 2012 by President Barack Obama on the occasion of the 100th Anniversary of Girl Scouting in the USA. 7. The first park in the State of New York is located in Lynbrook. It was the project of Troop 2237 of ELLM Association in Girl Scouts of Nassau County and was dedicated on March 11, 2012. 8. In 1920 the National Board of the Girl Scouts of the USA bestowed the title of Founder of the Girl Scouts of the USA on Juliette Gordon Low. 9. All of these statements are "True." 1944 Liberty Ship #2246, scrapped in 1972. 1948 President Harry S. Truman authorized a US Postage Stamp in honor of Juliette Gordon Low. 1983 President Ronald Reagan signed a bill naming the new Federal Building in Savannah, Georgia in honor of Juliette Gordon Low. October 28, 1979 Juliette Gordon Low was inducted to the National Women's Hall of Fame in Seneca Falls, NY. Juliette Gordon Low's portrait hangs in the National Portrait Gallery in the Smithsonian's Reynold's Center in Washington, D.C.
10. When the organization began in Savannah in 1912, it was known as the Girl Guides, after the Girl Guides that Mrs. Low had worked with in Great Britain. The name was changed to Girl Scouts the following year, because Mrs. Low wanted her girls' organization to be perceived as equal to the fledging Boy Scouts organization (founded in the US in 1910) and she felt that "Scout" was a stronger word than "Guide." 11. Shortly before Mrs. Low's Death, Girl Scouts of the USA leadership sent a telegram to Mrs. Low that described her as "the best Scout of them all." Back when I was working on my Silver Award (10 years ago), three of my Girl Scout friends and I decided we wanted to impact younger girls in our community by bringing them the joy of Girl Scouting. We decided we would run a Daisy Troop. Being new to the Girl Scout Leader world, the thought of running an hour long troop meeting was daunting. We were wondering what we would do with 10 Daisies for a whole hour. Now, most seasoned Girl Scout leaders know that there are many components that go into a Girl Scout meeting because the meeting isn’t all just fun and games; there is also Troop business that needs to be attended to like troop dues and troop decisions, but to us “new” leaders we weren’t sure what needed to be included. My Girl Scout Leader taught my friends and me what it meant to be a leader and all the components which should be included in a Girl Scout Troop Meeting. It is important that girls learn about the Girl Scout Promise and Law, while building courage, confidence, and character. A Girl Scout Troop Meeting should be comprised of 6 parts—Pre-meeting Activity, Opening, Girl Scout Circle-Business, Activity, Clean-Up and Closing. (Snack is optional). Of these 6, the Opening, Clean-up and Closing should remain the same. Pre-Meeting Activity – an activity for girls to do before the meeting; should be simple and easy so no direction needs to be given. Activity— this is the time for activities that will allow girls to build skills, try new things and explore their interests. The Girl’s Guide to Girl Scouting and the Girl Scout Journey books are great resources for activities and badges to work on during this time. Clean-up—this is the time which should be allotted to clean up your activity… This is important because a Girl Scout always leaves a place cleaner than she left it. Closing— this is the perfect time for girls to reflect on their Girl Scout experience and what they learned at the troop meeting; this is also the time for having the girls gather in a Friendship Circle to say goodbye for the day. 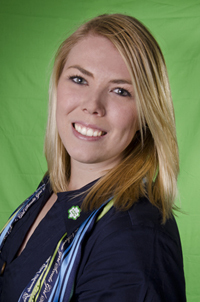 Cassie Rowan is the Interactive Media Coordinator for Girl Scouts of Nassau County. Gold Award Recipient- 2006 and Silver Award Recipient- 2002. Girls kindergarten through 12th grades can be Girl Scouts. Cookies, camping and crafts are means to the end, and they are fun. You could be an excellent Girl Scout and never sell a Cookie, go camping or do crafts. The Girl Scout Gold Award is the highest award given to girls in Girl Scouts, much like the rank of Eagle Scout for Boy Scouts. We like boys and Boy Scouts, but our two organizations are totally separate and different.